The Cosmic Machines are one of the newest additions to the Discount Vending Stores’ selection of vending machines for sale. We have been selling them for about a year and we get such great reactions to them from our customers. They love how easy they are to load, their size and the guaranteed vend sensor. The Cosmic machines come in a healthy vending machine version and a black version. The healthy machine version comes with a bright, colorful, juicy wrap. We offer two different sizes of this machine in order to accommodate various budgets and likewise, the many sizes of locations available. These vending machines for sale are very versatile. They can be adjusted or configured any way you like. They can vend all snacks or all drinks or any combination of snacks and drinks. These machines are extremely easy to load. All the drinks are loaded into a coil just like the snacks and the coil will work for all the different drink varieties. From small 8 oz. cans all the way up to 20 oz. bottled drinks. No adjustment is needed with shims and cams. The snack selections feature a single coil for the smaller candy bar sizes and dual coils for the larger entrée or chip sizes. They offer several removable, adjustable shelves to house the cold food / snack selections, and several rows for bottled and canned drinks. 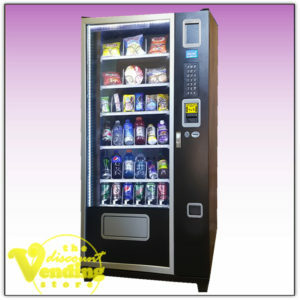 These machines are also equipped with the guaranteed vend sensor. This sensor tells the machine when an item passes through the laser at the bottom. If nothing passes through that laser, the machine automatically refunds the customer or allows for another selection. 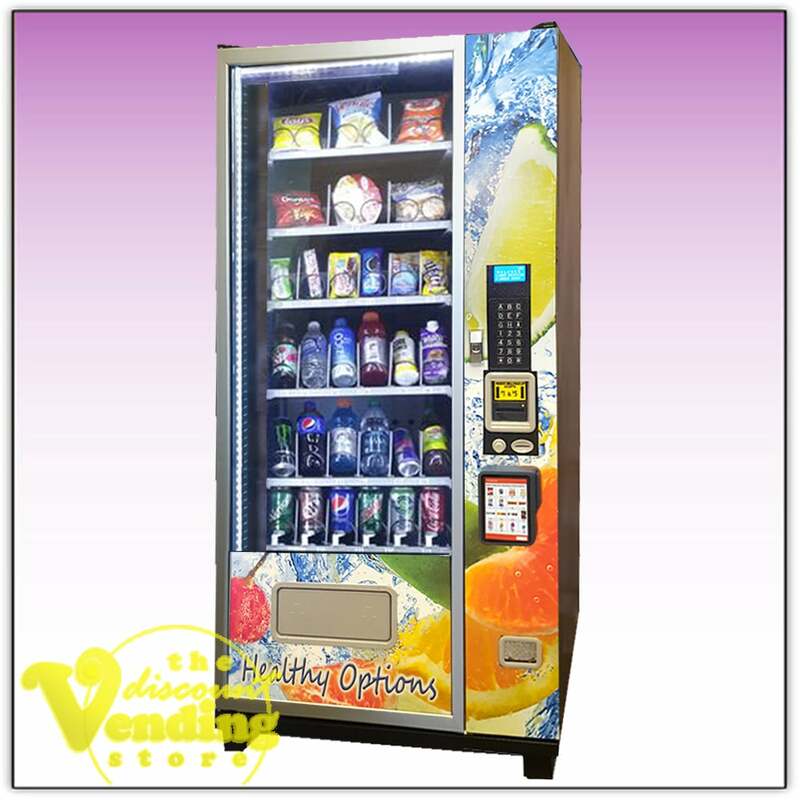 This is a great option to have to prevent customers shaking or jostling your vending machine. There are a few more great features such as the double-paned glass, LED strip lighting, vandal proofing, and a pull-out removal refrigeration deck. In addition, they are FCC Compliant and easy to operate, program, and maintain. The Cosmic machines contain a dollar bill validator which accepts $1 & $5 bills. The coin unit accepts nickels, dimes and quarters. A credit / debit card reader can also be added, which would provide a cashless vending experience and the possibility of doubling your sales. Also, if you’d like to purchase multiple machines, you can qualify for a Bulk Rate Discount! We carry these Cosmic machines exclusively at The Discount Vending Store. We provide all the parts and service for these machines. They are currently only available new and come with a 1 year warranty and a lifetime of tech support. Call us today for more information or check out the listings for them on our website. You can also watch our YouTube video about these great Cosmic machines.